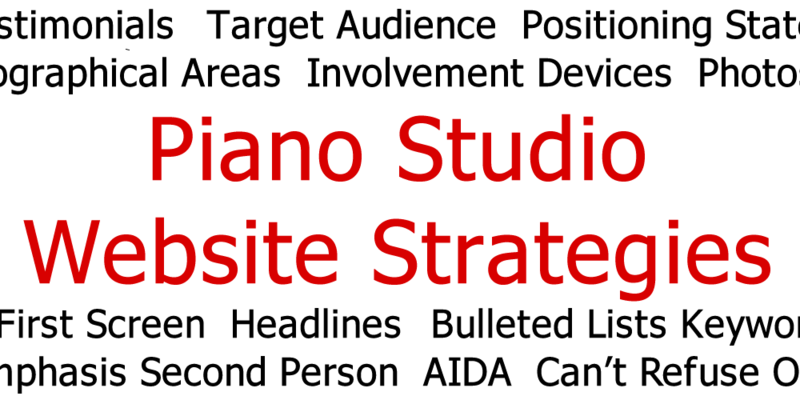 In Part 2 of this series I discussed Strategies #6 through #10 for creating a professional piano studio website. Ready for more? 11. How Effective Is Your Home Page? The main purpose of your home page is to briefly introduce visitors to your website, and help them quickly find the information they’re seeking. Your home page should minimally include your studio’s name, your logo (if you have one), possibly a brief tagline (for example, “Piano Lessons for the 21st Century”), the kind of students you teach, and a menu to the other main pages of your site. Keep the content of your home page brief and clear. Most of your content should appear on other pages. Minimize “About” page material (info about you and/or studio) on the home page. It may come across as too self-centered. 12. What’s On The “First Screen”? Make sure that a headline (see next section) is visible on the first screen (mine is “Piano lessons that develop highly creative and accomplished musicians”). 13. What Headlines Will You Use To Grab and Direct Readers’ Attention? Like a newspaper headline, including a headline on most pages helps to capture readers’ attention. The most important text on your home page is your principal headline. People reading online are notorious for skimming and scanning. If they don’t see something that intrigues them, a link to a more interesting experience is only a single finger movement away. This means that a headline is the most important text on a page. It also implies that if you convey your essential message in your headline, you’ll stand a chance of getting that message across to even the most casual readers. Using a single one of these strategies may lead you to an effective headline, but using two or three, or even all four, will make it even more powerful. 14. Are You Using AIDA? A powerful formula for writing content that sells is AIDA, which stands for Attention, Interest, Desire, Action. First you must capture your reader’s attention. This can be accomplished with a powerful headline as discussed above. You must then stimulate a reader’s interest by showing why she needs to take piano lessons from you. Next, you should excite her desire by demonstrating how your piano lessons will specifically satisfy her needs. Finally, ask her to take action by taking the next step, which for most readers means contacting you. 15. Are Your Paragraphs Short and Focused, Motivating the Reader to Continue? Since website visitors usually scan copy instead of reading word for word, keep your paragraphs short (like this one) so that your visitors are motivated to keep reading. There’s nothing like a long paragraph to put people to sleep. Pathetic? Perhaps. But it’s just the way it is in our content-saturated world. How many of these strategies can you implement before learning about Strategies #16 through #20 in Part 4 of this series?